Answer to the Burning Question: What Is Vodka? From its humble medieval origins as a medicinal agent, vodka has conquered the world. In 2012, tipplers downed 1.17 billion gallons (4.44 billion liters) of the distilled alcoholic beverage, making it the world’s most popular spirit. But what is vodka made from? To produce vodka, you must first ferment any foodstuff that contains sugar or starch, then distill the product to increase its alcohol content. (Fermentation means feeding sugar to yeast, so that the yeast can produce alcohol.) Today, most vodka is made from fermented grains, though you can also use potatoes, fruits or even just sugar. The fermentation step creates a product with only about 16 percent alcohol by volume (ABV) — too low for spirits. Upping that number requires distillation, or heating in a container called a still. Because alcohol boils at a lower temperature than water, you can collect the evaporated alcohol, separating it from the water. 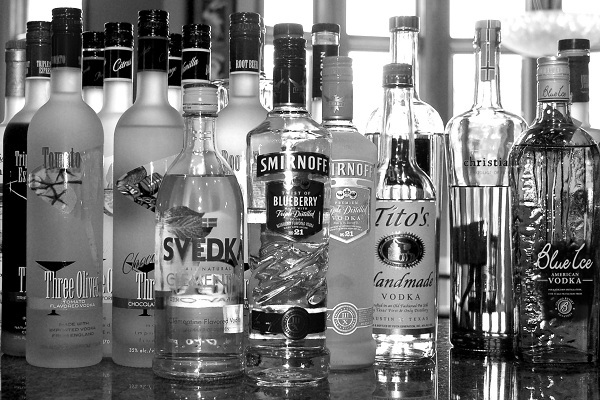 Most vodka is 30 to 40 percent ABV. “Rectified spirits,” like the American brand Everclear, reach 95 to 96 percent ABV.